Integrity, knowledge and excellent service – these aren’t just words, they represent how Overhead Door Co. of Burlington does business. Whatever your needs, you can trust us to offer high quality products and service. A variety of services – from garage doors to windows, Overhead Door Co. of Burlington can help you improve your home’s energy efficiency and aesthetic. We offer garage doors, exterior doors, interior doors, windows, trim and door hardware. Do you need residential or commercial garage door services in Burlington or a surrounding area in northern Vermont or New Hampshire? 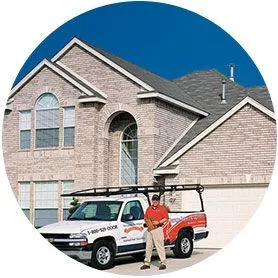 With over 67 years of experience in the garage door business, Overhead Door Co. of Burlington is the company to call! We also offer insulation services, window installation and more. We strive to provide our customers with high-quality products and reliable service all at competitive prices—and offer the highest level of professionalism, service response, and quality workmanship. Our team provides a professional approach to constructing exceptional quality projects which meet any budget and scheduling goals. No matter your needs, Overhead Door Co. of Burlington can meet them. We provide a wide variety of insulation, garage door and window services. Consider your search for “insulation contractors near me” over! Overhead Door Co. of Burlington is your single source solution for home and commercial insulation in the BTV area. Builders, contractors and homeowners throughout the area depend on us for a variety of insulation solutions—from spray foam for a new building to retrofit blown-in fiberglass attic insulation projects. Your garage door is helping protect one of your biggest investments (your home), so making sure it stays in top working condition is extremely important. This comes down to three things—correct installation, timely repair and proper maintenance and care. Overhead Door Co. of Burlington can help with all three! We offer garage door installation and garage door repair services in the Burlington, Vermont area and can give you tips for proper garage door maintenance and care to help prevent problems that could leave your home unprotected. If you need new commercial garage doors for your building (warehouse, firehouse, storage facility, etc. ), replacement is urgent. Leaving your business unprotected could mean a loss in productivity and important finances, as well as damage to your reputation. A properly working garage door can prevent this by providing protection against harsh weather conditions and burglary. Do you need new windows for your home? Look no further. We install windows from a top manufacturer in the industry, including JELD-WEN, PVC Industries, VELUX and more, in a variety of styles. No matter your needs, aesthetic taste and budget, our team will help you choose the perfect windows. Whatever your door or window needs in Burlington, Vermont or a surrounding area (including Williston), look no further. Overhead Door Co. of Burlington has you covered. From commercial garage door services to residential garage door repair to window installation, we do it all. Welcome to Overhead Door Co. of Burlington, your source for professional insulation and other products for the home. Builders, contractors and homeowners throughout the Burlington, Vermont area depend on us for a variety of products and we are proud to serve them.